Just one of 18 individuals arrested in the torching of opposition-aligned Raajje TV has been charged, according to the Prosecutor General’s Office. Evidence gathered was too weak to charge the rest of the suspects. Just one of 18 individuals arrested in the torching of opposition-aligned Raajje TV has been charged, according to the Prosecutor General’s Office. 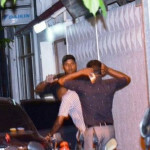 A media official told The Maldives Independent that the evidence gathered was too weak to charge the rest of the suspects. CCTV footage of the attack on October 7 2013, shows six masked men armed with machetes and iron rods breaking through a reinforced steel grill and a second wooden door before dousing the station’s control room and lobby with petrol. The ensuing fire destroyed the station’s offices, control room, computer system, and broadcasting and transmission equipment. The torching of the station occurred in the middle of presidential polls. Defectors from the ruling coalition have accused Vice President Ahmed Adeeb of ordering the attack. Adeeb, who was tourism minister at the time, denies this. Local media have identified the man who was charged as Mohamed Meead. He was jailed in late 2013 for drug trafficking. Sun Online says police found burn marks on his right arm. “We are currently checking if there is a way to charge other suspects in the case. Discussions are underway to avoid prosecuting suspects with minor involvement and use them as witnesses to testify against others” the PG office’s media official said. 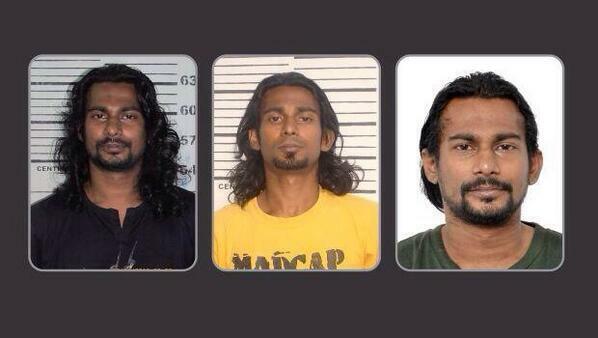 Meead was sentenced in 2013 along with alleged drug kingpin Ibrahim Shafaz Abdul Razzak on drug trafficking charges. 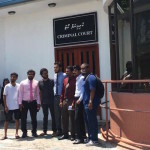 The high court acquitted Shafaz last year, citing insufficient evidence. Shafaz is a close associate of ruling party MP Ibrahim Sujau. 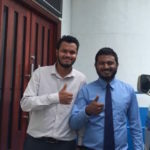 The pair were recently pictured at the Maafushi Jail receiving a third man, sentenced over the same drug bust, but pardoned by President Abdulla Yameen. An inquiry by a police watchdog found Raajje TV staff had asked for police protection when they learned of the imminent attack, but police officers had failed to respond. The now-defunct Police Integrity Commission had recommended pressing criminal charges against two policemen. Further footage of the attack shows an additional six masked men breaking and entering the building located next to the BKT Builing where Raajje TV’s offices were located. 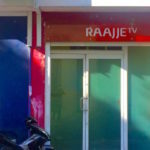 Raajje TV has said it believes the six men were attempting to find the station’s second studio. The Maldives has plummeted on the Reporters Without Borders’ press freedom index during the past four years. In 2014, The Maldives Independent’s Ahmed Rilwan disappeared, but there has been very little progress in the investigation. 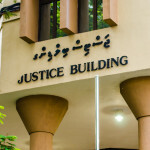 A trial over a near-fatal attack on journalist Asward Ibrahim Waheed remains stalled at the criminal court. Meanwhile, charges were never filed against a man who vandalized The Maldives Independent’s security cameras last year.